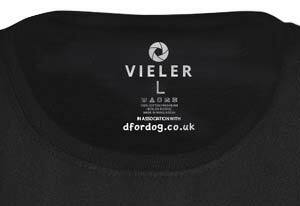 These stunning women's fitted dog lover t-shirts feature amazing photographs by the critically acclaimed dog photographer Christian Vieler. You've probably already seen and admired his work. Now you can wear it! 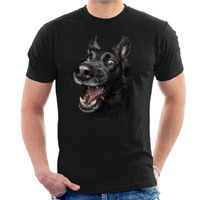 This t-shirt features a determined Black Shepherd Dog catching a treat. 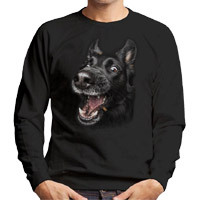 So if you are the proud parent of a Shepherd or you simply love the pure joy of the photographer's work, this is the t-shirt for you! 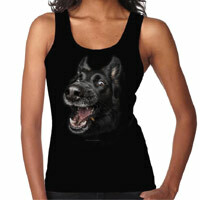 This garment is a fitted (ladies fitted silhouette), short sleeve women's t-shirt from the Gildan Softstyle® range. The fabric is 100% Ring Spun Cotton (weight 150gsm) which has been pre-shrunk to retain its shape. 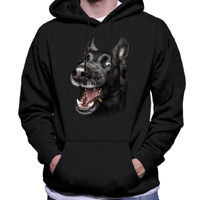 This design is also available as a unisex hoodie, sweatshirt or t-shirt or a women's vest top.